I got a call for another commissioned quilt this week. It will be a graduation gift, so as soon as the fabric for that gets delivered to me, it will become priority one, as it needs to be finished before the end of May. It won’t be my favorite colors to work on, as it’s for a boy headed to Oklahoma State University, so it’s black & orange. This one will only be full size, so hopefully it won’t take me too long. I enjoy doing the commissioned quilts, as usually these are for people, who while they appreciate quilts, don’t have any idea how to make one. 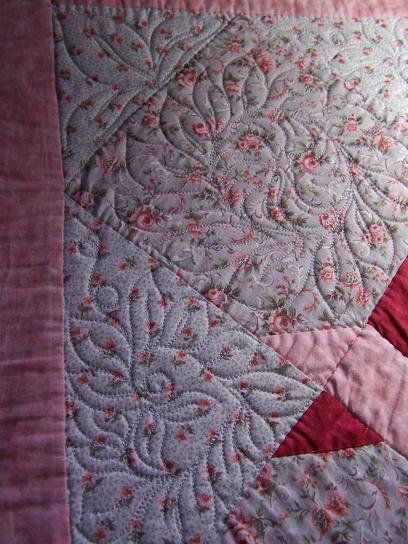 Therefore, when you are finished, and deliver the completed quilt, they are so thrilled. That’s fun. I like that. I will do the standard simple log cabin, so I can get it done in time. 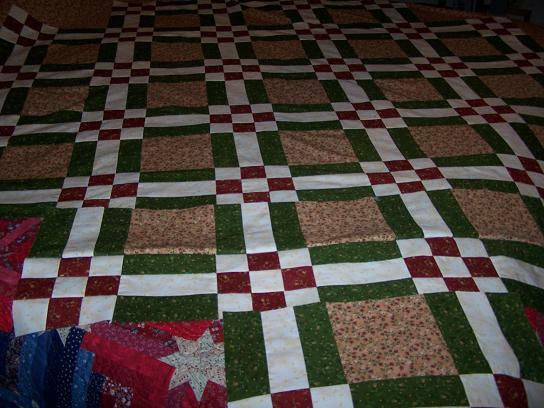 For those wondering, as I usually get some emails asking, for a simple pattern such as log cabin, or rail fence, I charge 7 cents per square inch, for the constuction of the quilt. That does not include fabric, batting, or thread. 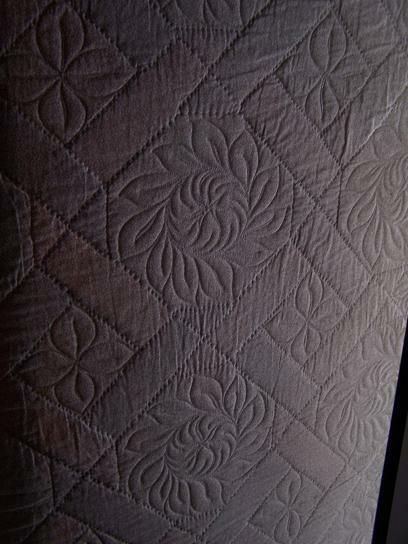 More complicated patterns, or more complicated custom quilting, would increase the price accordingly. 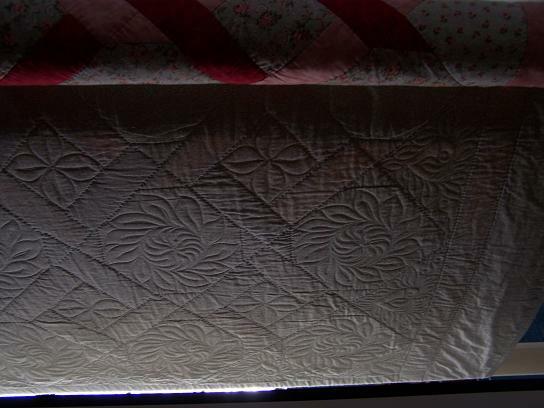 This is the quilting in progress, of the customer quilt I mentioned yesterday. 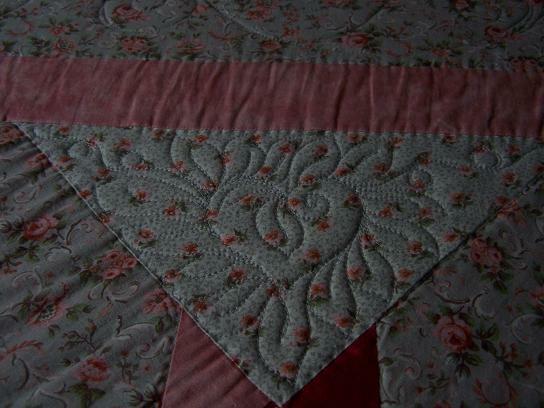 The quilt was completely finished, with stitch in the ditch hand quilting. After machine quilting another quilt for customer, she decided she would like me to try to add some quilting to this one. I knew it would have some challenges, but except for problems with the borders, I think it’s coming along nicely. I’m concerned about some excess fabric in the back in a few spots, but so far it’s looking pretty good on the back, I think. The only big problem I’m having is with the borders. I may have to just leave them be, as there is too much excess fabric, as you can see on the right side of this pic. Since it is already bound, there is no where for the excess to go. 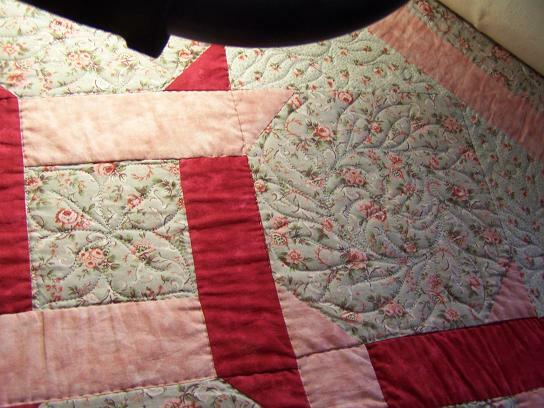 I already tried to lightly quilt one, and ended up with a big pucker. So, I will be frogging that when I get done with the rest. I will probably also leave the sashings alone. After I get done, I will show it to my customer, and see if she wants to leave them, or remove the binding. My customer happens to be the friend that brought the pics of mybaby to me week before last. I think she’s really going to like what I have done, so far. The weigh-in wasn’t so bad afterall. I didn’t lose any, but I didn’t gain, either. So for now, I’m holding steady at 144. There are still cookies in the house, though! I read my first issue of Quilter’s Home. I really enjoyed it, and will be looking forward to the next issue. No, I’m not just saying that because Mark said nice things about my quilting on that vintage top I posted previously. 😉 I really did like it!